The Briscoe Center has teamed up with KUT's Texas Standard to present Out of the Blue: 50 Years after the UT Tower Shooting. 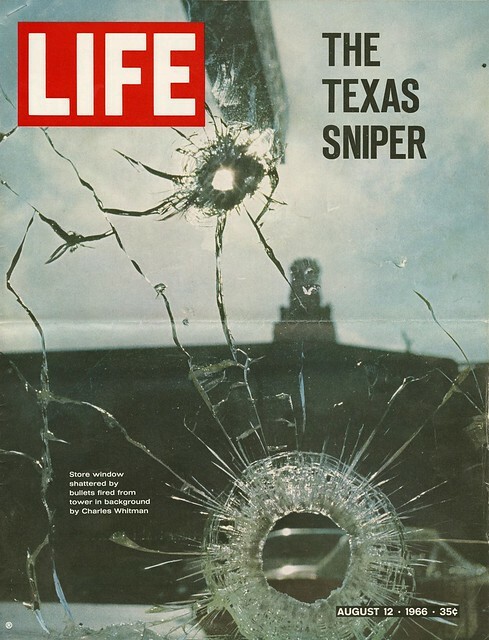 KUT has collected over 90 first-person accounts of the August 1, 1966, shooting and will exhibit them online alongside documents and photographs from the Briscoe Center's collections. Out of the Blue will air as a one-hour radio documentary across American public radio stations on July 25. "The Briscoe Center is proud to support KUT in order to create a living history of this tragic and important day in university history," said Don Carleton, executive director of the Briscoe Center. "Several years ago we partnered with KUT on a similar project related to the 2011 Labor Day wildfires in Central Texas. I'm confident we will again have success in creating not only first-class programming, but also a permanent historical archive housed at the center." The Out of the Blue project represents an hour-long radio oral history, a multi-part reporting series, a companion website and a permanent oral history archive. On Monday, July 25, Texas Standard will devote its statewide, hour-long broadcast to stories from survivors of the University of Texas Tower shooting on August 1, 1966. KUT spoke with some of the people involved in that day's events, including those who were injured and the Austin police officers who helped end the shooting. Many of the survivors were affected in unexpected ways. Most of these stories have not been shared publicly until now. Between July 26 and August 1, the Texas Standard will also air a series of five stories focused on the lasting impact of the shooting, covering topics such as campus security across the country, changes in the mental health field and gun rights. All these interviews and stories will be curated online alongside many items from the Briscoe Center's collections related to the shooting. "The Texas Standard is proud to partner with public media in Texas and the Briscoe Center, not only to share many never before publicly-shared stories of this historic event, but also to preserve those stories for future generations," says Stewart Vanderwilt, director at KUT. In addition to the broadcasts and website, KUT and the Briscoe Center will host two panel discussions later in the fall. On October 25, the public is invited to participate in a discussion of the importance of oral history at the Austin History Center. On November 2, KUT and the Briscoe Center will host a panel discussion at KLRU studios chronicling the gun debate around mass shootings from 1966 to the present. All materials created by the project, including oral history recordings, transcripts, correspondence and ephemera, will be archived at the Briscoe Center.